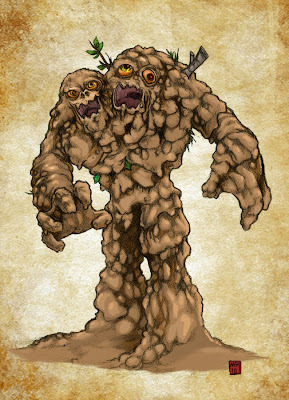 Slimy, amorphous Earth elemental, the Mudmen live in deep caverns and isolated jungles. They tend to live in large groups, and also posses limited shapeshifting abilities - such as the ability to squeeze through small cracks, "morph" into various shapes, and change the density of their bodies. Mudmen are limited in that they must stay in a wet environment, else they run the risk of drying out.